As a pump systems manufacturer, ensuring that our systems continue to provide end-users with optimized performance that exceeds expectations is of paramount importance to us at Metropolitan Industries. With day-to-day pump system performance revolving around its controls and monitoring capabilities, it became obvious that Metropolitan’s sole-source responsibility towards providing complete water movement and management solutions should include the manufacturing of customized control systems that seamlessly integrate with our packaged systems. Today, our dedicated Controls Division focuses on delivering customized control and monitoring solutions that provides flexibility, ease of use and optimized functionality. 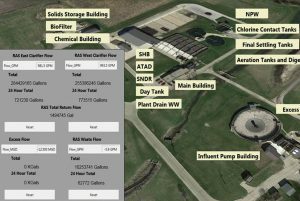 We design and build our own control system packages with full customization capabilities that can be integrated with any of our newly manufactured and installed packaged pump systems or with an existing system already in place. 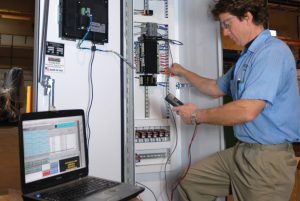 We house a large inventory of control system components, including starters, breakers, H-O-A switches, indicating and alarm lights, enclosures and related parts, in addition to multifaceted equipment including variable frequency drives, distribution panels, and switch gears. 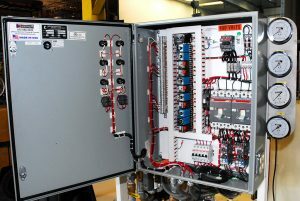 This gives us the flexibility to custom manufacture complete control systems in addition to the added ability to quickly build and ship control panels and related accessories for emergency replacement situations. Our U.L. rated process controls are built with the necessary instrumentation, power equipment and motor controls to complete the most complex projects. In addition, our controls division staffs a team of in-house programmers specializing in development of custom monitoring capabilities that fully integrate into our control system packages. The end-result is a streamlined control and monitoring experience made possible by our single-source philosophy commitment to providing the most dynamic pump and control system solutions in water movement and management. Metropolitan’s “Growth Through Innovation” philosophy is clearly evident in the area of process control. Combining vast experience with imagination in the on-going development of new products, our design engineers continually introduce new technology – maximizing the efficiency and performance of your pumping system. To fill the void in process controls left by commercially available products, Metropolitan aggressively develops U.L. rated process controls to meet the needs of individual end-users. In most instances, by integrating our control systems with existing equipment, optimum system performance is achieved. Our electrical designers take our experience and project specifications to create a solution for controlling your system. Communications, Monitoring, and Control are all commonly integrated into our systems. Highly trained engineers and programmers will design and develop an advanced control system to meet application requirements or an existing control system can be retrofitted to meet today’s demands. There are many control options available to ensure all of your needs are met. We believe in research and development and have an entire department dedicated to discovering new and innovative solutions. Over the years, we have acquired over 30 patents and trademarks, with many more pending in order to offer new and unique solutions. 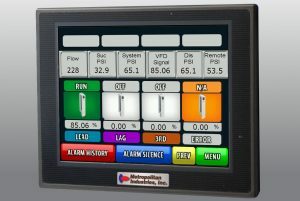 Metropolitan takes pride in the quality of our control systems. Part of our quality control are the UL procedures which we apply to our products. For a complete listing of our 19 UL categories, please see below, or visit the UL Online Certifications Directory. Whether installing a new control system or upgrading an existing, Metropolitan can practically integrate the most sophisticated and intuitive control and monitoring capabilities that is best optimized for your water, wastewater or mechanical application. Getting in touch with our team of expert pump control system experts is just one click away.